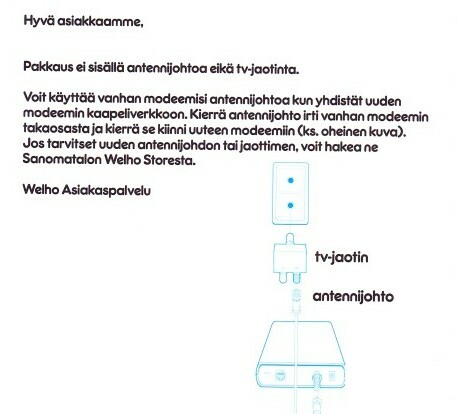 My ISP Welho, a Finnish cable TV company that was recently sold to another operator called DNA, finally sent me the new 40M cable modem I had already ordered six weeks ago. It’s not the speed I was really after, since my previous 10M internet connection was fast enough for anything I would need. It was the price reduction in the monthly fee that you get by upgrading your modem, from €44.90 to € 35.90. Sounds like a sweet deal, even with the 6 month contract period. 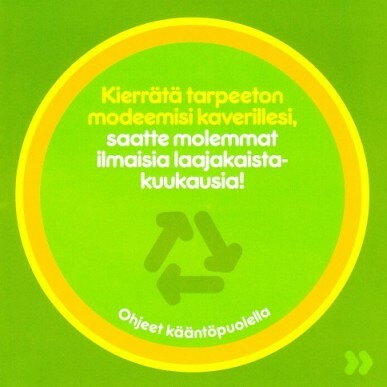 Well, that’s another nice idea for a “save the environment” themed campaign. Of course the only problem here is that my friend would not have the necessary cables for plugging in the modem, since you didn’t send me any. So he would have to jump in his car, drive to your store in downtown Helsinki and pick up the parts from there. Tagged with ISP, marketing, Welho.